With no bathroom bill or sanctuary cities bill coming down the pipeline, Texas’ 86th legislative session is anticipated to be tamer than its predecessor. K-12 funding and property tax reform are the most highlighted items among state legislators. Despite less national attention, members of the Dallas County Community College District, including Chancellor Joe May and Vice Chancellor Justin Lonon, are in Austin lobbying, attending public hearings and serving on expert panels in an attempt to get bills passed that they believe will benefit DCCCD colleges and the communities they serve. Here’s a look at the DCCCD’s efforts at the Texas Capitol. The only thing that the state Legislature is required to do is pass a budget. This means determining how much is given to Medicaid, transportation, public education and higher education for the next two years. Despite about a 2.6 percent increase in 2017 for funds appropriated to DCCCD, the district and many community colleges in Texas have seen a gradual decrease in state funding since 2011. Eastfield history professor Matt Hinckley is following the legislative session and believes that an increase in funding for DCCCD schools is essential. Another important issue for the district is challenging a property tax cap proposed by Gov. Greg Abbott. This plan would reduce the ability of Dallas County, cities, school districts and the DCCCD to increase taxes for funding. Abbott’s proposal claims that a statewide increase in K-12 funding would offset school districts’ inability to increase taxes over the cap. However, there’s no mention in his plan on how community colleges and other local government entities would make up funds without the ability to tax. DCCCD, despite being the second-cheapest tax in Dallas County at 12.4 cents per $100 of valuation, receives much of its funding from property taxes. Proposals to increase school funding while capping local tax growth were tried and failed during the 85th session and will likely meet challenges from legislators who favor local control. Other important issues for DCCCD include an increase in funding for small business development centers and reducing course transferability issues among students moving on to four-year universities. According to the Greater Texas Foundation, about $60 million is wasted each year on tuition payments for classes that ultimately don’t transfer. Lawmakers have tried to resolve this issue in the past but have found it difficult to regulate institutions that operate within their own unique systems. Nonetheless, Lonon believes it’s important to dedicate efforts to fix this obstacle. “It’s something Dr. May has been passionate about,” he said. Faz and Lonon said that DCCCD’s strategy begins with research on relevant topics and bills. Then, the team seeks to collaborate with other organizations to create coalitions around specific legislation. DCCCD often collaborates with community college organizations, community and industry groups, K-12 organizations and school districts. During the last session, DCCCD supported a bill that would allow the district to award bachelor’s degrees in early childhood education at one of its colleges. Eastfield was considered, but the district decided to place that program at Brookhaven College. DCCCD collaborated with organizations invested in early childhood education and higher education to get the bill passed. Once the legislative session begins, the team facilitates one-on-one meetings with legislators. The chancellor meets with legislators and testifies at committee hearings. Faz said that their multi-pronged approach puts them in a good position to get desired results. 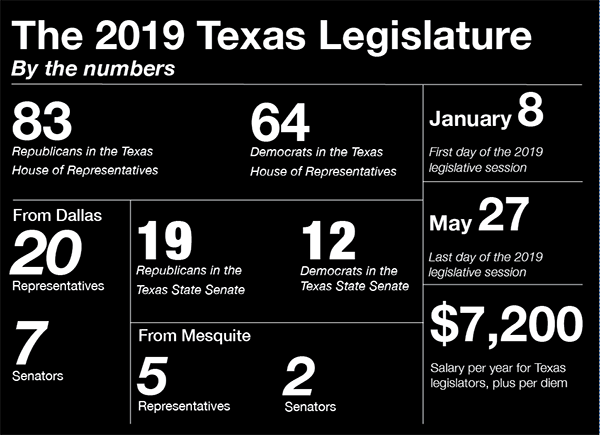 Faz sends out a weekly email to employees to update them on what they’ve been up to in Austin and any major developments within the Legislature. He said he strives to make the email informative, but also provide a creative twist to engage everyone who reads it. In the email, Faz also provides an email and phone number for answering questions about bills, the legislative process and to connect people with legislative members, all to get employees involved in a process that may have a substantial impact on them and the students they serve.